The simple designs of Belgium designer Jan-Jan Van Essche are at the heart of our latest editorial, reflecting on “The Emancipation of Everything”. Pronouncing the feeling of watching long, graceful blades of grass swishing in the breeze, “lissome” is an attempt to explain something that is fundamentally ineffable, a moment of serene awareness that you’ve experienced but never had a word for. That kind and gentle awareness of ourselves and, as a consequence, of our surroundings, is the larger story that inspires us at Lissome. We know of the power of clothing to shield and protect, and in times, we have welcomed the use of clothing as a “Cloak of Invisibility”, working its magic. Nonetheless, we are filled with hope that we are moving towards a more inclusive future in which protection is less needed and we can dress freely and in accordance with our own comfort and creativity. A guide to Antwerp’s thriving slow fashion scene and an interview with Jasmien Wynants of Flanders DC, a Belgium NGO coaching creative entrepreneurs, about supporting fashion brands with their sustainability efforts. Gender justice shouldn’t be a discussion, it should be a given, yet it is not. Equal opportunity, equal pay, and equal safety and respect are still conditions women across the globe are fighting hard for. Whether we like it or not, fashion creates stereotypes in our minds, a certain lifestyle we want to participate in. But fashion also has the power to break those patterns. People BERLIN plays with this mechanism and reverses it in many ways: While the fourth collection of the fashion brand based in the German capital is about to be launched, hardly anyone knows the faces behind the label. Tracing perception. In our ability to hear, see, smell, taste, and touch. In encountering the world through our senses, through streams of information flowing in and out of our consciousness. In mixing the natural world with the man-made in our minds. Louise Richardson’s fragile pieces beautifully amalgamate decay and rebirth and the circular existence of each material included in her artwork. Through her work, we are invited to question our view on beauty and on the meaning of everyday objects – discarded ones that we have no use for anymore. Anne Schwalbe and Ayumi Paul are two Berlin-based multidisciplinary artists whose work using hand-sewn textiles reflect their respective interest in the transformation of fabrics, of experiences. With distinct points of view, both women use their unique garments as methods of exploring seemingly duelling ideas: creation and mending, tangibility and ephemerality, timelessness and ageing. Clare opens our eyes to a rebirth of global grassroots activism in her uplifting read Rise & Resist: How to Change the World. As the old year draws to a close, winter’s hushed existence and the coinciding, barren nature tell their own tale of a seeming absence of life and a state of transition. For our latest fashion story, we collaborated with selected designers whose work comprises forms of conservation, ephemerality, nature-driven production methods and antique fabrics. IKKIVI is a unique and beautifully curated online destination for sustainable fashion design from India, and, in the words of its founder and curator Nivi Murthy, “a portal to take a deeper breathe, to be mindful of the little things, to engage in meaningful conversations, and to shop slowly”. At Lissome Studio, we consult you on brand personality and visual identity, creative direction and photography, as well as graphic design and event curation. 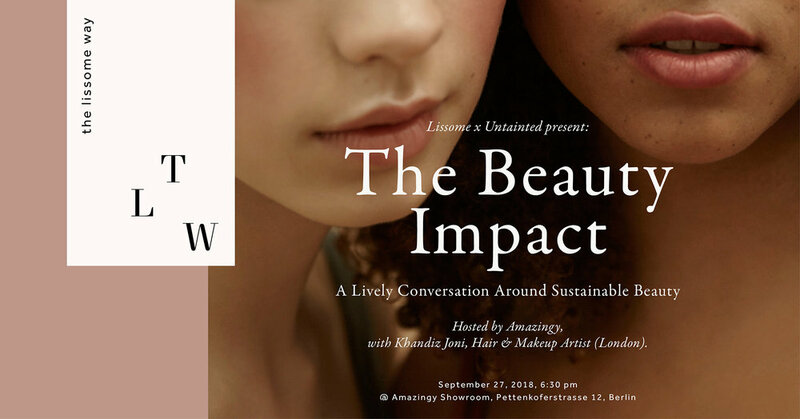 From conscious fashion to beauty and lifestyle, we host workshops, talks, and fashion tours, as well as intimate fashion get-togethers and dinners. © 2019 LISSOME. All rights reserved.